Whether your family vacation includes the immediate family (parents and children) or the extended family (grandparents, aunts, uncles, cousins, etc. ), it affords everyone the opportunity to escape the routine and enjoy time with family members. So, if you are looking for a destination to visit annually or a special place for that one time event here are a few ideas to get you started. Disney Cruise Lines provide Disney themed events and activities designed for the family. You can combine a 3-4 cruise with a stay at Disneyland or Disneyworld. There are no casinos on board. Royal Caribbean Cruise Lines offer many supervised activities for active youth of all ages; rock climbing, putt putt golf, ice skating and surfing, just to name a few. Great variety of ship sizes and ports. Carnival Cruise Lines celebrated Youth Experience is grouped by age: Camp Carnival (Ages 2-11), Circle “C” (Ages 12-14) and Club 02 (Ages 15-17). Plenty to do for the adults as well. Wide selection of ships and ports. Norwegian Cruise Line has its youth programs offering supervised activities for each age group. Suites and even villas are available that can accommodate up to 24 family members. Beaches Resorts have brought Sesame Street to the Caribbean. While the kids are taking part in Sesame Street themed activities the rest of the family can enjoy the splendor and ambience of some of the most luxurious beaches in the Caribbean. RIU, Iberostar, Dreams, and Melia are a few of the all-inclusive chains of resorts offering activities and specials for families. Theme Parks are designed specifically for family entertainment. Although not all-inclusive, lodging can be provided on or off the park and food plans are available. Disneyworld, comprised of The Magic Kingdom Park, EPCOT, Disney’s Hollywood Studios, Disney’s Animal Kingdom Theme Park, Disney’s Typhoon Lagoon Water Park and Disney’s Blizzard Beach Water Park could keep a family fully occupied and enthralled for a week or more. Disneyland actually consists of two distinct theme parks: Disneyland and Disney’s California Adventure. Although a fraction of the size of Disneyworld, with its location in Southern California other family venues abound such as the beaches and the San Diego Zoo. Universal Studios Orlando consists of two theme parks: Universal Studios and Islands of Adventure. The emphasis is on action and thrills with an abundance of thrilling rides and attractions. Adventures by Disney offers extensive incredible worldwide destinations. Activities are designed for children, teens, adults and grandparents to enjoy. That special Disney touch involving locals provides each family member with an unforgettable, personal and rewarding experience. Tauck Bridges strives to provide the best in accommodations and service. Whether you are staying at a dude ranch out west, touring the major cities of Europe, exploring the Costa Rican rainforests or on a Tanzanian safari you will be traveling first class. 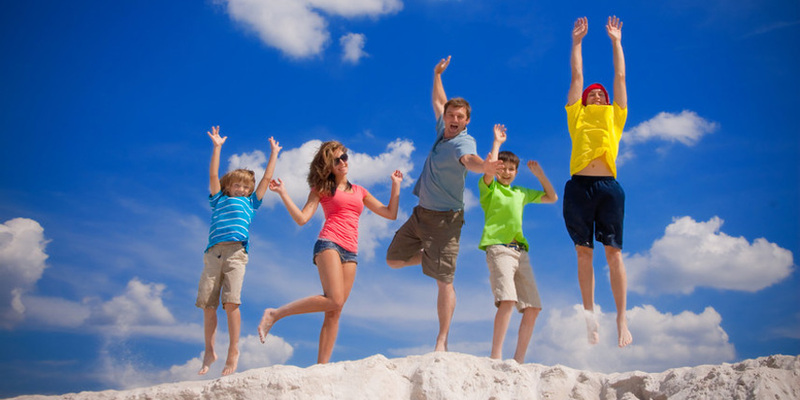 Backroads Family Trips are fun stimulating, adventures for the active family. Activities include biking, hiking, rafting, kayaking and exploring the most interesting sites in the world.